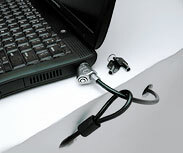 It locks your laptop into one place, possibly unsupervised, while you grab a quick snack down the hall, or across the street- useful in schools, or other places where u need to keep a computer running, and cant take it with you- or in your hotel room while your are at dinner with a friend. One end is a loop, just like the previous model, and the other end contains the lock and the latch, in one unit. The lock/latch end is pushed into the little oval locking port on your computer, then is rotated 90 degrees and the spring loaded pin is pushed into place. All in less that 10 seconds... easily, with one hand. If you need to leave your laptop someplace for a little while, and have it locked up as far as screen saver password, this is a MUST for your arsenal of anti-theft devices while less aesthetically pleasing than the previous model, the NG34 has an advantage - its only one piece! The previous model (NG-30) which we reviewed quite favorably had 2 parts... <plus 2 keys, of course..> The possibility of digging through your bag looking for the 2nd piece if you were in a hurry and didnt bother to lock it back on wasnt a problem, but this is an improvement on a GOOD design! We give this product a 9 thumbs up out of 10.